Under-Rated! is a new blog feature where I will occasionally post about a film and/or film score that has somehow been lost in the ever-thickening haze of mediocrity...and then, if available, point you to our review of the original score. Our first entry goes all the way back to the year 2000. THIRTEEN DAYS was simply a phenomenal effort by director Roger Donaldson to recreate the nearly-two-week-ordeal that almost brought the USA into nuclear war. The writing and acting are both sharp. The faithful recreation of the West Wing is stunning and director Donaldson is somehow able to build a lot of tension even though we all know the outcome of the story. What is so poignantly conveyed is just how close we came to mass destruction during those days. If you, like me, weren't alive or were too young to remember those events, after viewing this film, the title "Cuban Missle Crisis" will never ring the same. When it comes to TREVOR JONES' score, all that needs to be said is that it matches the tone and tension and film to a "T". Back in early 2001, this score truly got my attention and after seeing the film, was one of my cinematic highlights of the year. I originally gave this score an 8/10...and that rating easily holds to this day. 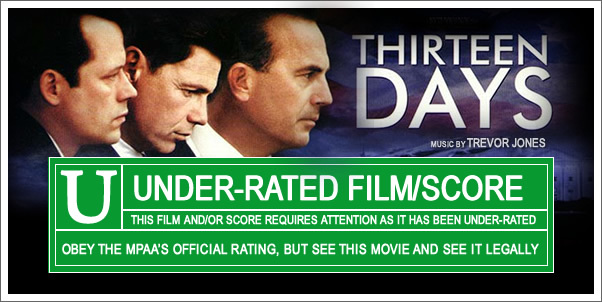 Check out our original soundtrack review for THIRTEEN DAYS here.